Why do I bother blogging……. Why do I bother blogging……. I’ve been asking myself this a lot lately. You may have noticed I haven’t been writing much lately. A combination of having a hard working wwoofer here for over two months who has transformed the place, while I plod along trying to get this house more finished for selling, and now, display in this year’s Sustainable House Day. Well, it’s days actually, the event is held over two consecutive Sundays, the 7th and the 14th of September. The event is run by volunteers, and as a result things must happen slowly, our place is not yet listed as of today, almost the end of June. 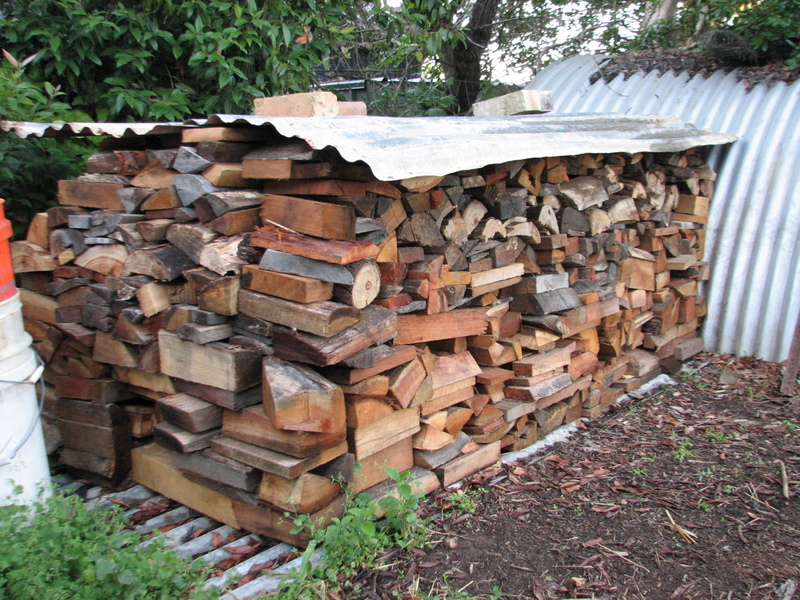 Yes, in Qld that’s one year’s supply of firewood for an energy efficient AGA! 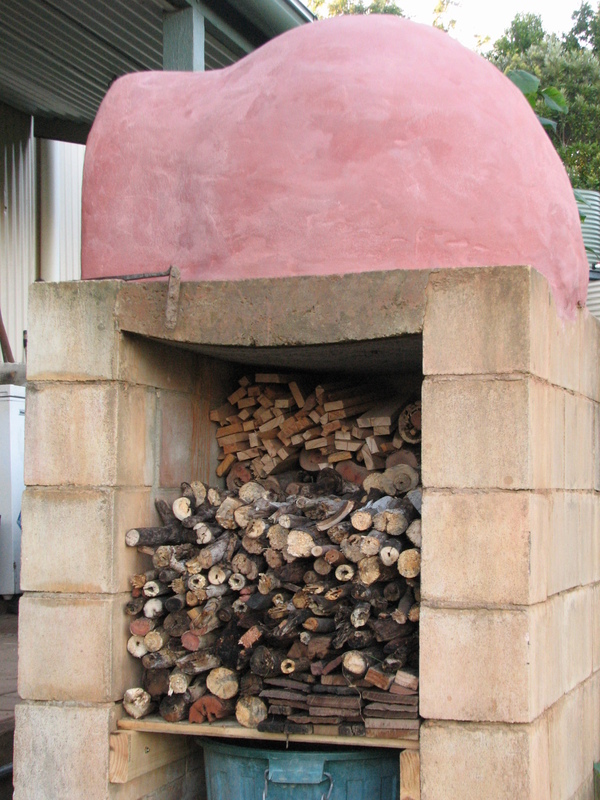 Alessandro, apart from making pizzas, has tidied up the yard extensively, finding so much firewood to burn in the AGA we have hardly touched our stockpile from last year. Whoever buys this place will inherit a year’s supply of fuel to keep the old girl going all next winter. Meantime, I’ve been finishing pelmets, painting doors, and even making the place actually lockable! I may even have fixed quite a few air leaks in the process, hopefully making the place even warmer in Winter. It’s only taken eight years or so….. Alessandro who comes from a country rife with crime is totally bewildered by the fact we don’t lock our house. Βut back to why do I bother blogging……. To a large extent, I use DTM as a storage of information, and I use it during exchanges on certain forums by linking to articles published here in often vain attempts to convince people that major change is upon us. I often fail. Recently, the AIMN published an article by Kaye Lee on the worth of having High Speed Rail in Australia. The AIMN is a barely hidden ALP lovefest site where the writers take turn at hating the current government. Not that you can blame them mind you, but that topic can get tiresome. So any time I get a chance to put some alternative stances on the state of the world, I grab it with both hands. It always lands me in deep water, I’m labelled negative and without hope. To be frank, I don’t know myself why I bother. Neither I nor anyone else can ‘save the world’. I won’t save Kaye Lee either. She’s been convinced by the techno-utopians that we have a future low flying in renewable powered HSR. Even Dave Pollard, a soulmate of mine in many regards is asking himself the same question…. Homo Rapiens…. I’m going to use that from now on..! A book worth reading obviously….. I keep blogging, states Dave, because I owe just about everything about my current situation to my blog. My writing and my readers’ responses have shaped and radically altered my worldview. I have to agree with this…… starting DTM was a bit of a life changing moment; I actually had to start thinking about why I did things, but lately, I feel that I have started running out of things to say. How many times can I write about why Climate Change, Peak Oil, Limits to Growth, and Economic Collapse will combine to become our downfall before I’ve said it all? And realistically, anything I add here now is to simply say ‘it’s all getting worse’ and ‘I told you so’. And besides, Dave does a far better job than I, his blog is among the very best on the whole interweb as far as I’m concerned. Also, something weird has happened over the past couple of months. In March and April, DTM was going absolutely gangbusters (by my humble standards at least) with page reads going exponential. Then it all stopped. At first I couldn’t understand what was going on, maybe it was my lack of writing at this busy time, but WordPress gives its bloggers some neat tools, like the ability to see from which countries in the world visitors come from. And it appears Americans have literally stopped coming here. And I mean by more than 75%. I know I’ve insulted a few by renouncing Guy McPherson’s near term extinction thesis (I’m prepared to give humanity another 150 years instead of just 30…) but at the expense of sounding like a conspiracy theorist, I wonder if the CIA or some such has put a block on this site. The rapidity with which the numbers have fallen off is bewildering. Not that blogging is a popularity contest, as I told Kaye Lee; it’s much easier to attract readership with how much you hate Tony Abbott than telling people civilisation is about to collapse……! To change tack in this final paragraph, here we are near the end of June, and Winter has still not arrived. We’ve had one cold morning that almost gave us a light frost (there was ice on the Citroen’s windscreen, but not the ute’s – and they were parked side by side – so go figure) but now the morning’s minimums are again over six degrees C, everyone’s still complaining about the flies (which are currently the worst we have ever seen, even in Summer), cabbage moths are still flying around the garden, and I’m still mowing the grass, even if very intermittently. Down south, they’re being hammered by blizzards and storm strength winds, clearly we are stealing their warmth… Climate Change? WHAT Climate Change……? Hopefully we’ll get a cold snap or two over the next couple of months, otherwise the garlic crop will be another failure, just like last year. Aah Tasmania, wherefore art thou…? I contacted the Gasfield Community Support group after hearing Laurence Springborg saying on the radio that no workers in the CSG industry had become sick, and the air and water tests were good quality. I started in the industry in 2008, and worked for 3-½ years on a mobile drill rig. Initially I was employed by Mitchell drilling who were taken over by AJ Lucas. With the exception of one well, at all other times Mitchell drilling /AJ Lucas were contracted to Santos. I was employed as the “offsider” initially, graduating to senior drillers assistant. One of the tasks was mixing chemicals into the mud pits to pump down the drill string. There were different polymers used. They pumped “mud” down the drill string. (Salt water, KCL and polymer JK261, (a lubricant)). On an average lease, if they were not taking losses, you would use an average of 12 tons of KCL and 15 pallets (720 drums /10,800kg of polymer) to keep the viscosity up and lubricate the drill bit. The polymer was mixed in the pits through a hopper. The polymer had to be sprinkled into the hopper and it was blowing in the face, in the eyes; we were constantly breathing it in. This happened for hours at a time. We had masks, with a diaphragm sometimes, otherwise paper. The masks were also used when mixing the cement for the casing if Halliburton did not come in and we were doing the cement job ourselves. When drilling down, going through the Permian or Jurassic riverbeds which were very permeable, sometimes the drilling muds would disappear. They could take huge losses We took core samples when Santos told us to. They took core samples on every drill hole, usually about 600 metres in depth. 80% of the time they got pretty good returns – getting most of the returns back up the drill into the pits. But 20% of the time, especially in Fairview, east of Injune, they couldn’t stop the losses. They could use approximately 20 tons of KCL (semi-trailer loads full) with water. There was 50,000 litres of water in each of three pits. On one rig, in a 12 hour shift we used 27tons of KCL along with 100,000 litres of water and multiple other chemicals. The next 12 hour shift would then come on and this could go on for days doing exactly the same thing until the losses were stopped. They would use 9.4 heavy – saturation point- lots of KCL, JK261, CR650-polymer. The KCL was to “weigh down” the gas bubble. When they were taking losses they would use ‘frac seal fine’, composed of silver paper, coarse saw dust, trying to fill the hole, to block it. In the Gunnedah basin south of Coonabarrabin, they drilled a hole and hit the fresh water aquifer. Fresh water was pouring out of the hole, diluting the salt content. They had to bring trucks in to take the water away; they put the casing in and tried sealing it off with cement on the outside of the drill string. There were problems in the Gunnedah basin because the aquifers were close to the surface, they had to get through the aquifers and keep drilling to get to the coal seam. They got a drill string stuck in one particular hole. They brought in black stuff in a 1000 litre container, called “pipe free”. I’m not sure how it worked. I think they pumped it down the drill string to try to free up the soil and recover the expensive equipment from the hole. It stunk to high heaven. It was very smelly, dangerous: we were told not to get any on our skin. It happened in a hole in Fairview; Santos owned the property near Injune. On every fifth hole or so they got stuck but could get the tool free without major problems apart from patience and time. But if the tool sheared off they fished for the tool or cemented the hole up and moved on a couple metres, cutting their losses and started drilling again. (This happened about three times when I was there but there was only one time they used “pipe free”.) It is a big problem for them and expensive if they lose tools down the hole. Weatherfords did the logging. They used radiation sources. I heard that they had lost tools down the hole, but not at the time I was there. At times there were problems with the end plug with gas bubbling through the cement, they couldn’t stop it. There were bubbles coming up through the water that was sitting over the cement in the cellar. I saw it three or four times. On Fairview, there were lots of drill holes, it was like a porcupine. Drill holes could be as little as 150 metres apart at times, at other places kilometres apart. There are now a lot of production wells there. I started getting sick, with nose bleeds on a regular basis in 2011. I had never had a nose bleed in my life before. My work schedule was– out for 18 days, home for 9 with 2 days travelling out of it. (I am an organic farmer, totally self-sufficient and solar powered, and I was trying to set myself-up for older life. I was working out there for the money. I was cautious about saying anything- I had lost a job before for speaking out). I was better when got home on days off; when I went back out, again there was blood dripping from my nose. I had nose bleeds in the shower. We broke up earlier than expected at the end of 2011 because of wet weather. I was coughing and couldn’t clear my chest. I went to the doctor in late November/ early December. He listened to my lungs and sent me for a CXR. I had a terrible feeling of anxiety and just felt terrible. The anxiety was there all day from the minute I woke up to when I went to bed. I was sent for a CT scan and told I had moderate emphysema. I had only smoked for a couple of years, age 19 and 20, not since. I looked up the internet and seen Dr Roger Allen near the Wesley. I did a test lasting 6 hours and had a lung biopsy. I was told I had inflammation, lung infection, bronchitis. I wanted compensation, adamant that the cause was what I had been using at work. Dr Allen wouldn’t commit to what was causing it. I had sickness benefit for a couple of months – I was off for a couple of months then they told me I was fit to work. I wouldn’t go back to mixing chemicals; they told me there was nothing else for me – got nothing for me. They wiped their hands of me. Now I am back on the farm. I am not coughing as much. I still haven’t 100% capacity in my lungs. I have cough and phlegm and loss of lung function. When I was working on the rigs I would have spasm of my hands. I would grab a set of stilsons to do up a drill joint, when trying to let go I couldn’t open my hand. I had to use the other hand to open the knuckles back up. There was lead based grease, real thick grease, used on the drill joints, also a zinc based grease called ZN50. The young fellows I was working with here getting it all over themselves. It is carcinogenic. They were using 20kg buckets in a 10 day period. The other driller, age 27, had bad skin. It looked like dermatitis. He had red skin around his eyes and hairline. It would look better each time he came back from break. We lost contact. A lot of people are out of work, with a downturn in the industry. It was a 24 hour rig, 12 hour shift, 4 on crew, driller, and senior offsider, 2 junior offsiders. There was always a crew on break. Apart from the people you work with you don’t know other people. There were big camps. We lived in camps or hotel accommodation, up to 80% of the time in camps. People complained about the water at times. The truck just didn’t look hygienic. The water was next to the septic tank which overflowed several times. People were getting stomach bugs. I am unsure if the drinking water was bore water. Santos took the drinking water away a couple of times because of complaints. The water in the mud pits was recycled to the next lease for drilling. The drill cuttings went back into the pits. When in the Gunnedah basin they started lining the pits with big plastic liners. They didn’t tend to line them in Queensland. There were hundreds of tons of cuttings. It was a problem. I’m not sure what happened to the pits, or the plastic or the cuttings. When we were out there, if there was 4 inches of rain the salt water in the pits started flowing over. If they knew the rain was coming, they would try and pump the mud out and dump it somewhere else like in new pits Santos planted fodder trees, not Australian natives. I think they planted them to get rid of coal seam gas water by using it for irrigation. There were maybe 10,000acres that Santos planted. That then became a problem. Now seeds have washed out and are growing on the sides of the road, in waterways. They have become a pest now. The industry took off very quickly; it went from a controlled Australian industry with a few different Australian companies and rigs, to overnight rigs coming in from Canada, Mexico, everywhere. Whatever controls they went through in the past seemed to have disappeared over night. 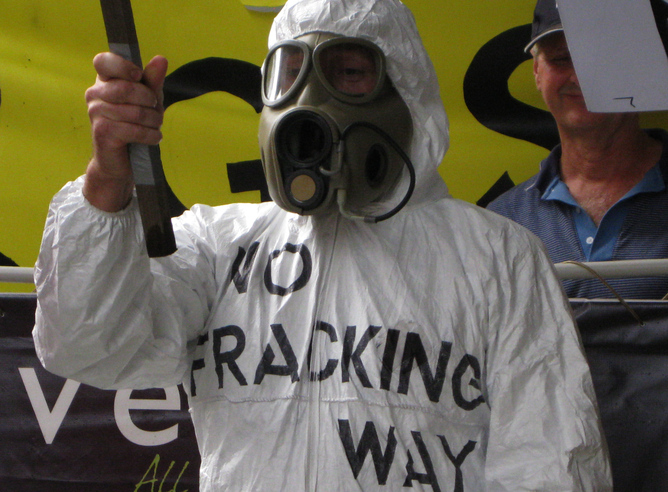 When I worked in the Gunnedah basin, there was lots of protest by the locals, and road blocks to go through. There were also open cut coal mines being licenced to overseas buyers (particularly the Chinese) who were buying the land up. The farmers didn’t like it. Because of the protest our image had to be squeaky clean and there was a lot more control on the industry than in Queensland. Problems with farmers were not such a problem in Western Queensland. There was an occasional well on their property, maybe up to 10 wells on big properties. Santos was building a big airport. I didn’t see any protest by farmers in Queensland. It was not a problem on big properties. Santos and Origin own some big properties. 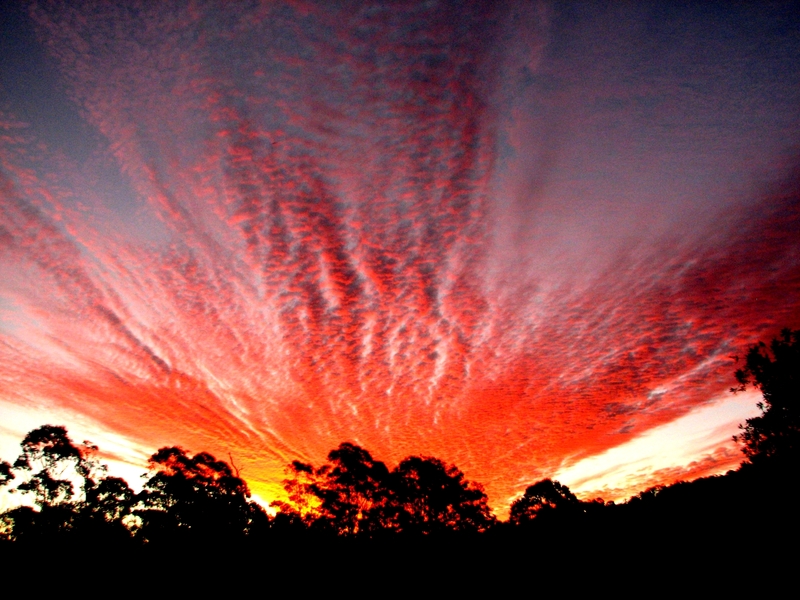 Arcadia Valley, north of Injune is a magic pristine country of big aboriginal significance. It is a rift valley, with a huge escarpment and caves. It shouldn’t have been touched, it should be heritage listed. 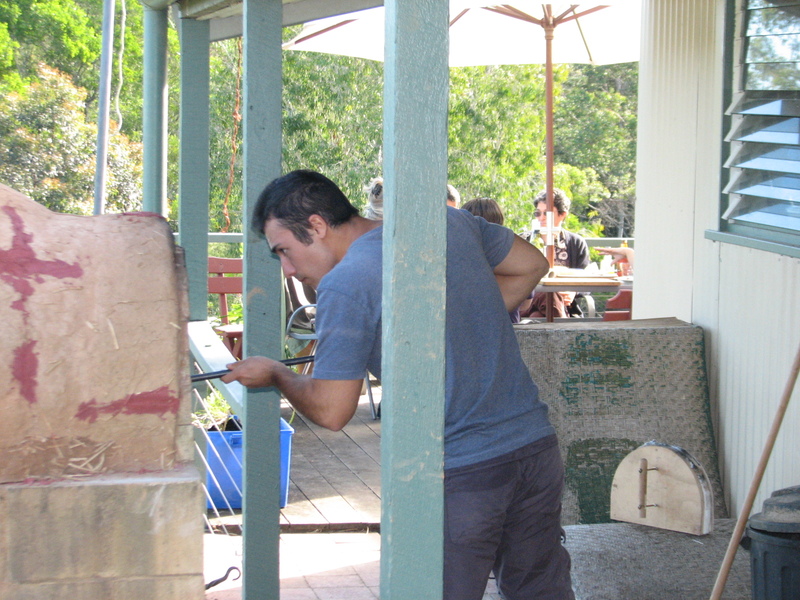 AJ Lucas had one rig in the Arcadia valley and disturbed sacred aboriginal sites. There were maybe six holes. There was no more or no less care than in Fairview. I think it was a shame. The wastage was immense. In a 12 hour shift 2000 litres of diesel was used just for an exploration rig. (For the production rig to get the gas out of the ground, the fuel usage would be astronomical.) In addition to the drilling there were air conditioners and generators running all the time. There were 100’s of rigs in the area. There were diesel spills and leaks. Other waste, Industrial bins full of plastic drums were emptied twice a week; there was a huge amount of food wasted. Everything you ever wanted to know about Climate Change. This is a must view video that Mark Cochrane put me onto. 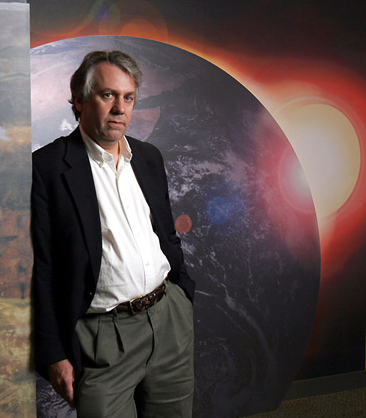 It’s by MIT’s Kerry Emanuel giving a ‘Climate 101’ talk over at Skeptical Science. The first hour is his talk. The rest is his answering questions. He was one of Mark’s professors at MIT 20+ years ago. At that time, Mark tells me, he was not yet actually convinced about anthropogenic climate change. He also has the shortest book with a solid overview of climate change science that I know of (link). Kerry Andrew Emanuel (born April 21, 1955) is an American professor of meteorology currently working at the Massachusetts Institute of Technology in Cambridge. In particular he has specialized in atmospheric convection and the mechanisms acting to intensify hurricanes. He was named one of the Time 100 influential people of 2006. In 2007, he was elected as a member of the U.S. National Academy of Sciences. He hypothesized in 1994 about a superpowerful type of hurricane which could be formed if average sea surface temperature increased another 15C more than it’s ever been (see “hypercane“). 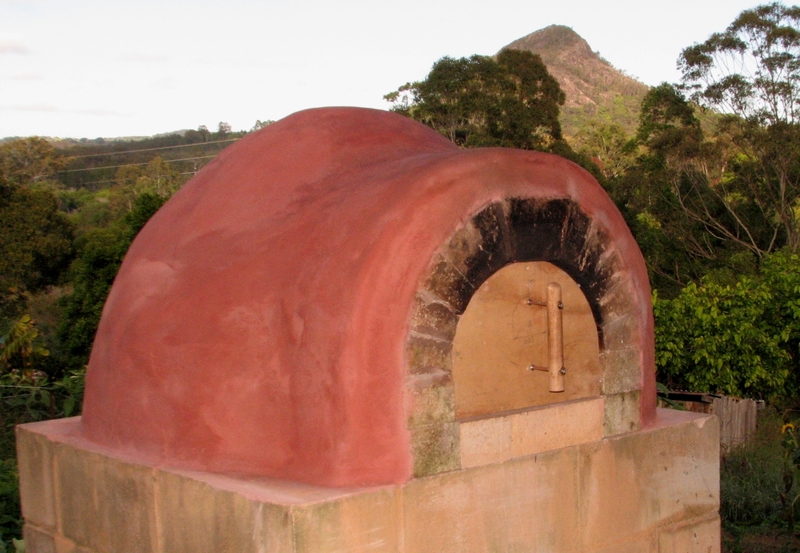 Yes dear readers…… the cob oven is finished. And waterproof… no more collapses in the rain. Nine years in the making, I finally finished rendering it yesterday with a cement render consisting of two parts white cement and three parts white sand, with a smidgin of red oxide colouring that I had to very finely tune to not look garish, and yet imitate Terracotta… On the whole I am very pleased with the result, and am looking forward to putting the gained experience into building another slightly larger one in Tasmania when we finally get there! 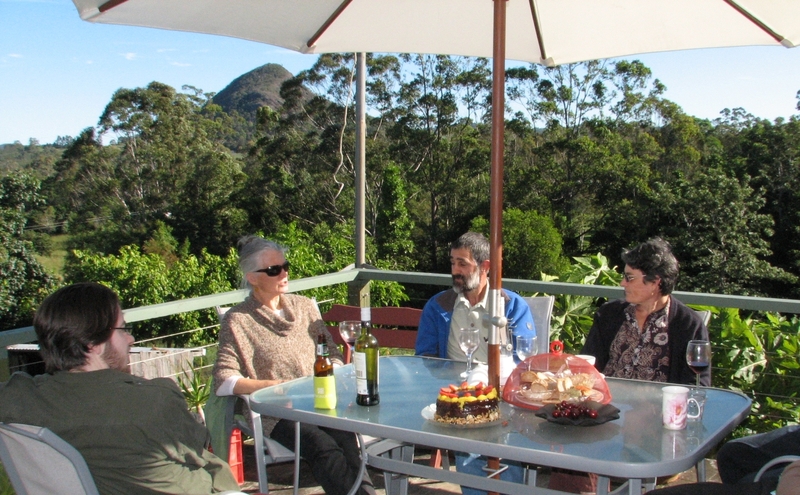 Before the final coat was applied, we held a party in honour of Glenda’s birthday. 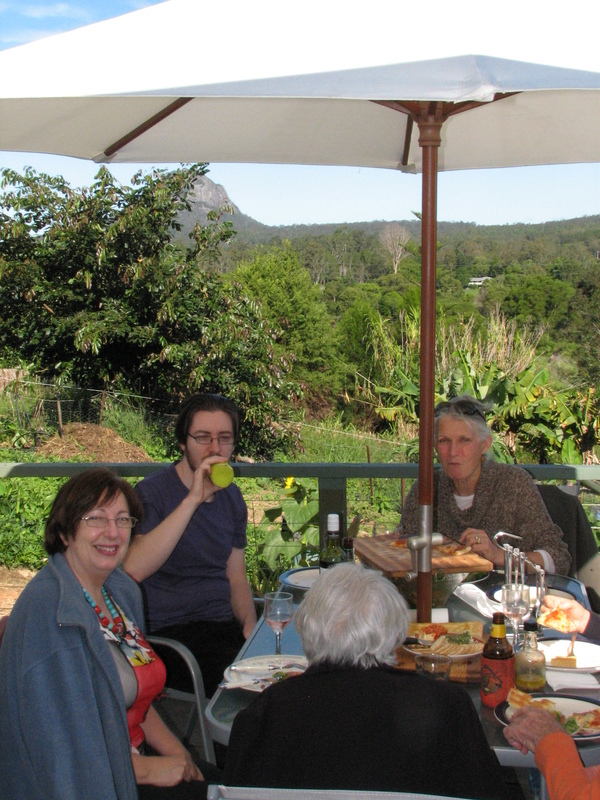 Good company, some nice wine, and Alessandro’s divine pizzas ensured a most pleasant afternoon on the deck on what turned out to be our first true Winter’s day…. in the sun! What more could you ask for? The day was topped off with the most amazing sunset we have ever seen from our deck….. a sign from the gods that maybe we had an exceptional day…? Whatever it might have been, it sure was impressive…. almost reminds you of the fire in the oven. Mark Cochrane on Age of Limits…. Sorry for the long absence but after Aol I had some long overdue vacation and then came back to another bout of ‘could be’ climate change. Yet more flooding….sigh. AoL was a great experience again this year. Orren Whiddon and the group at Four Quarters do an excellent job of bringing together a collection of speakers with different view points on the various challenges that we face and an audience that is much more aware than your typical collection of conference goers. From all reports, this is a unique experience. The venue allows for deeper discussions both in the presentations and in the intervening times since everyone is immersed together for the whole event. Dennis Meadows said that it was the first presentation he’d ever been able to give where he didn’t have to first defend Limits to Growth. Similarly, I didn’t feel any need to assume much of the audience was unfamiliar with climate change. Although several of the speakers were also present last year the talks themselves were new. Albert Bates gave an interesting overview of ecovillages through time, combined with his extensive insights from all of his years participating in ‘The Farm’. Offline, my talks with him about biochar were fascinating. I thought I knew something about the subject but he gently disabused me of that idea! I haven’t received it yet, but I look forward to reading his book “The Biochar Solution” link. Dmitri Orlov provided his insights on the parameters that define ‘communities that abide’ which really provided a wide ranging look at the ways in which human communities have found to persist. It can be disturbing to our sheltered sensibilities in the current age to consider such things. John Michael Greer, an ever eloquent speaker, gave his interpretation of what could be “Dark Age America” and provided an amazing depth of historical comparison and interpretation. Gail Tverberg laid out her belief that “Converging Crises” would basically send us on the fast road to a low energy future as EROEI limits bite hard when the resource limits and the financial shenanigans combine to make the back side of Hubberts curve a cliff. Since I know there is interest I will comment further here on her contention that the inevitable energy collapse means we will be at or below RCP 2.6 so there is no point in worrying much about climate change. Though it would be horrific, we may well hope that she is right since it would limit the climatic damage. Alas, she apparently does not realize that aerosols are currently shielding us from roughly 0.8C of warming that is in the so-called ‘pipeline’ so that even her ‘rosy’ climate scenario is less than benign. Few seem to realize that 2C is not a pleasant outcome and has no scientific basis as safe goal for international efforts. The star attraction, and rightly so, was Dr. Dennis Meadows’ presentation about “The Dynamics of Societal Collapse”. It was a low key but powerful presentation about the progression of ‘Limits to Growth’ from possible to inevitable. We have squandered the decades of forewarning we were given and now will have to pay a painful price to try to adapt at a time when resources are increasingly limited. Never was a presentation of such dire gloom received with such sustained applause. As for my own talk, it was well received, despite coming at the end of a 7 hour nonstop marathon by Tverberg, Greer and myself on day 3 of the conference. I was literally amazed at the stamina and attention of the audience. It was truly a special collection of people who not only put up with another 1.5 hour presentation but were clamouring for more even after another 1.5 hours of questions. It was a pleasure to meet several of you who frequent this thread in addition to many others who do not. If there was one common thread amongst the talks that I would point out it was the lack of ‘catastrophist’ visions. No one was under any illusions that the troubles we face are trivial but neither was anyone foreseeing an apocalypse or ‘near-term human extinction’. There is no easy out from this predicament. P.S. I am told that all of the talks will be made available on a DVD in the coming months.